John and Emily's lives are upended when Emily is struck by a mysterious disease. As Emily's condition strips away her senses, she is left to find her true self and true love. 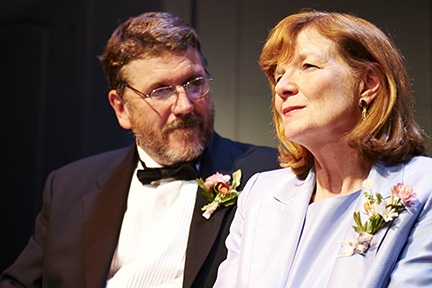 Bock's redemptive story of a family's journey from loss to hope premiered at Playwrights Horizon in New York in 2011. "A Small Fire heats things up at Steep... Schultz's deftly ambiguous direction is paired with the wholly committed truthfulness of her uniformly excellent cast." 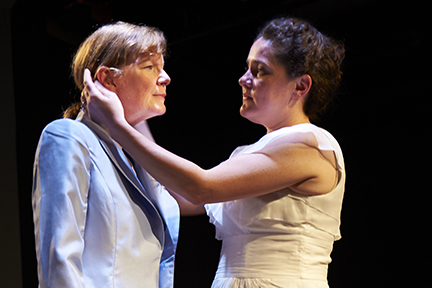 "Joanie Schultz's finely orchestrated staging...is highly infectious...all four actors tackle the situation with braveness and honesty"
"A Small Fire ignites deep reflection...an evocative look at drastic life changes." "only about 80 minutes long. But the changes it charts...are massive and devastating... A Small Fire is quite a good play." "Director Joanie Schultz, with the superb cast, leaves the audience on the edge of the seat from start to finish"
"funny, intelligent, and gut-stabbingly good... a hilarious yet thought-provoking production."